Who were the 2009 – 2010 CHL champions? That’s right; the Rapid City Rush took home the Ray Miron President’s Cup on May 5, 2010. 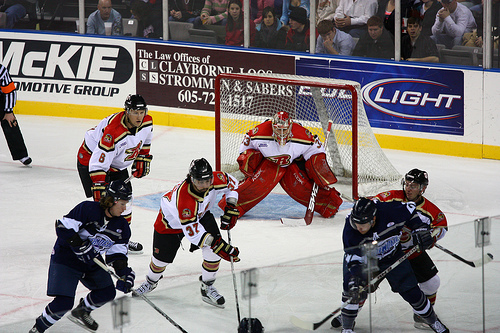 On their home ice, the Rush beat the Allen Americans in double overtime. Scott Wray shot and scored the winning goal that set cow bell-ringing fans into a frenzy. Tyler Redleaf was at the game and has vivid memories of Wray’s winning goal: “I was excited; me and my friend were jumping up and down and giving each other high fives. I was so speechless and energetic at the same time. I just felt like jumping out of the crowd, running onto the ice to congratulate Scott Wray with scoring the best most memorable goal ever. OH! And that he’s the man.” The winning goal helped the Rush beat the Allen Americans 4 to 2 games in a seven game series, finishing the Rush’s season at 43-14-7, a season in which they scored 93 point. This year the Rapid City Rush is off to a good start. One of the Rush’s first home games of the year was sold out and the team was honored with the raising of the CHL championship banner. It rose with pomp while the fans were going insane to congratulate the Rush for a great 2009 – 2010 season. “My favorite player on the Rush is Colt King. He’s so aggressive and is very good player. When the banner rose up I felt speechless. Me and my friend Spencer were screaming at the top of our lungs saying ‘Go Rush.’ It was a great time and I hope they win the cup again,” said Redleaf. That night the Rush played the Allen Americans for their first time since the championship game, and the Allen Americans got revenge with a 3 – 2 win. The season has just begun for the Rush; maybe they will even repeat last year’s success and win the President’s Cup again.